Home » Blog » Leave Gerry Adams alone! How do we deal with the crimes of former terrorists who have gone on to become leading statesmen? How do the victims and the aggrieved in such conflicts get justice – and, if justice can be obtained, should it be at the expense of peace? The world’s most famous ex-terrorist-turned-statesman was, of course, Nelson Mandela. With the background guidance of advisers like Don Beck – see: Don Beck & South Africa – Mandela went from being a convicted terrorist still committed to the ‘armed struggle’ to one of the greatest mediators of peace and reconciliation our world has ever known. Not only was he jailed for sabotage and conspiracy to violently overthrow the government in 1964 but he continued to plot violence whilst in prison – by his own admission (1995) ‘signing off’ on the murderous Church Street bombing of 1983. Yet, in spite of the publicly-acknowledged ‘crimes’, he became a symbol of peace, unity and hope not only for millions of South Africans – black, white and Asian – but people right around the world. So does it really matter now if, in the past, Gerry Adams was a member of the IRA? Does it even matter if he was implicated in or somehow responsible for the murder of Jean McConville? Adams may well have the blood of others on his hands too – after all, P J Browne (2011) does refer to him as “the leader of the psychotic IRA unit in Belfast in the early 1970s”. But, in the grand scheme of things – in the context of Adams transcending his past (in a similar way to Mandela transcending his past) to become critically important to peace, hope and prosperity now – does it matter? Certainly it matters – deeply, painfully so – to those like the children of Jean McConville and the family and friends of the other ‘Disappeared’. In them we see the workings of a PURPLE/BLUE vMEME harmonic, demanding justice for the loved ones who were taken away from them. Doubtless in some, there will also be the more simplistic revenge harmonic of PURPLE/RED. In those who simply demand justice for crimes committed, we see unrelenting BLUE, oblivious to the wider social costs of its insistence on punishment. In the mischief-making of Adam’s political rivals and enemies, we see RED and ORANGE self-aggrandisement manipulating PURPLE/BLUE, PURPLE/RED and BLUE for their own ends. 2nd Tier thinking can see this. It acknowledges it with due emotion and understanding but transcends the PURPLE/RED desire for revenge on the ‘others’, PURPLE/BLUE’s desire for justice for their loved ones and the absolutist dogma of the BLUE vMEME that crime must always be punished – an eye for an eye and a tooth for tooth. 2nd Tier thinking sees the ‘big picture’ and what needs to be done for the greatest good – planet, continent, nation, region, community, family and individual – as far as all the competing needs can be balanced in service to that greatest good. So the desire to determine if Adams was in the IRA and if he was implicated in McConville’s murder – and to punish him accordingly – is both understandable and valid…but it almost certainly doesn’t serve the greatest good. Northern Ireland: a permanently fragile peace? As I’ve written before – see: First Kosovo, then Northern Ireland? 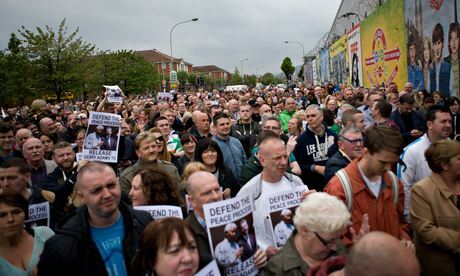 – PURPLE tribalism lies at the root of Northern Ireland’s problems. It might be given a BLUE sheen of sophisticated structure in terms of national and religious allegiances…but, as Henri Tajfel & John Turner (1979) would recognise, at root it’s a dangerous game of tribal in-group versus tribal out-group. As Tajfel & Turner show in Social Identity Theory, tribal identification – who’s in our tribe and who’s not-of-our-tribe – so easily mutates into tribal conflict, simply from tribal rivalry. PURPLE tribalism can be superseded in organisation by BLUE monolithic superstructures such as the Soviet Union and Yugoslavia which subsumed lesser entities. It can be made irrelevant by the BLUE/ORANGE scientific rationality of Modernism and the GREEN egalitarianism of Post-Modernism. But, like a weed pushing through the cracks, tribalism can suddenly reappear with even the slightest failings of more complex paradigms. PURPLE is almost certainly a driving factor in what Carl Gustav Jung (1916) termed race memory. Perhaps in the genes but certainly in the culture, stereotypes of the ‘others’ and rituals commemorating both victories and defeats feed vague and indistinct loathings down through the generations. While ever there are distinct and separate tribal identities, the potential always exists for those identities to become paramount and to enter into conflict with the ‘others’. When there are real issues to compete over – such as housing and the geographical territory that goes with it, access to healthcare and schooling, jobs and, not least, the long-term future of the province – PURPLE is easily roused into aggression against the ‘other’ tribe when there are RED-driven leaders keen to exploit that tribalism for their own self-aggrandisement. Slobodan Milošević tore apart Yugoslavia with it in the 1990s. Vladamir Putin is currently exploiting it to Russia’s geopolitical advantage in the Ukraine – see: Has Vlad played a Blinder? Even Alex Salmond’s crusade for Scottish independence can be read in this kind of light. 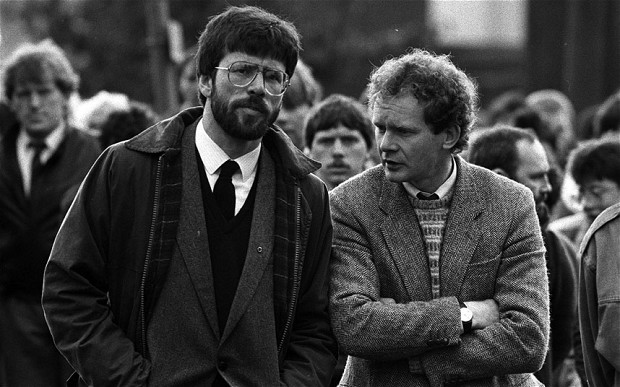 Fortunately Gerry Adams and Martin McGuinness, having been the kind of leaders that exacerbated tribal differences in the 1970s and early 1980s, have grown in complexity of thinking, to provide leadership in the late 1980s and 1990s that has led slowly but surely to a viable peace process. The sophistication of these 2 operators is demonstrated by their reaction to Adams’ release. On the day of Adam’s arrest in connection with McConville’s murder, McGuinness was reported by the likes of the Daily Telegraph’s Steven Swinford & Claire Carter as having attributed a ‘dark side’ in the Police Service of Northern Ireland’s decision. On Friday 2 May McGuinness, according to the BBC’s Vincent Kearney, went further and spoke of “a cabal within the PSNI” who were pursuing “a negative and destructive agenda to both the peace process and to Sinn Féin”. Effectively Adams was saying that, from Sinn Féin’s perspective, the peace process was safe. 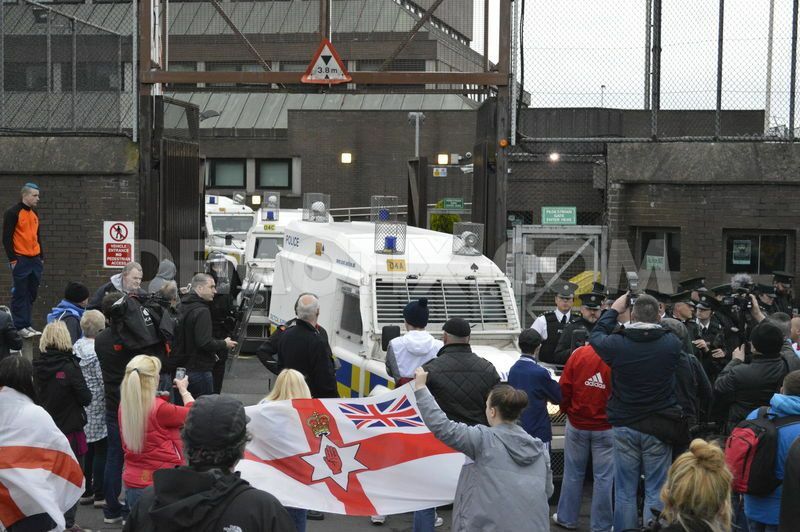 The Republicans pulling support from the PSNI could have tipped Northern Ireland backwards. 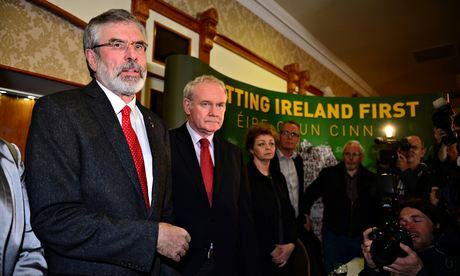 But McGuinness’ blistering criticisms of the PSNI cabal enabled Adams to look that much more magnanimous and reassuring. Adams then said something tremendously significant – though few commentators appear to have picked up on it. In continuing to deny he had ever been a member of the IRA, Adams chose his words carefully: “I have never dissociated myself from the IRA…” In other words, he may not have been an official member and, therefore, not culpable of membership of a proscribed organisation, but he has always supported it. He then went on: “.. and I never will.” For the Republicans, Adams was pledging a lifetime’s support to the cause of the IRA. Adams’ words can be meta-stated as: I will support the cause the IRA stood for as long as I live but the means they used are done with. No more of that method. It was a masterful act of giving something to both tribes, indicating he knows how to walk the precarious route he and McGuinness have to take to keep the peace. On the Unionist side, their leaders seem less certain of how to manipulate multiple variables. David Trimble certainly showed himself capable of seeing the bigger picture – or at least recognising the way the wind was blowing for Unionism. But essentially he had to sacrifice his own political career to deliver Unionism to the greatest good of the Good Friday Agreement. As for Ian Paisley, did he really change from being the firebrand scourge of Irish Catholicism or did McGuinness just charm him into working with him? Peter Robinson seems far less sure of himself and to have a more distant (though reputedly still friendly) relationship with McGuinness. With the possible exception of Trimble, the Unionists seem to have failed to develop thinkers of the calibre of Adams and McGuinness. If it were possible to prosecute Adams now for involvement in McConville’s murder, to do so would be a grave mistake. The hundreds of Republicans and Unionists who turned out to protest respectively at Adams’ arrest and his release hint at the serious potential to shatter the fragile peace. For all the pain and the sense of injustice the McConvilles and others like them feel, for the greater good and the hundreds, if not thousands of lives at risk, it might be better if the crimes of the past were left in the past. …is that it has a way of catching up with you. Adams and McGuinness have persisted throughout the years in admitting as little as possible about their involvement with the IRA and terrorist activities. McGuinness’ refusal to come clean about his IRA past was a compromising factor in his failed 2011 campaign for the presidency of the Republic of Ireland – see: Martin McGuinness for President? It was only through the Saville Enquiry that we learned he was “probably armed with a sub-machine gun” at the catastrophic events of Bloody Sunday. Even given the opportunity to confirm that finding, McGuinness repeatedly denied it (BBC News, 2012). As with McGuinness then, so with Adams now. Denials of involvement with the IRA and Republican terrorism are patently absurd. Of some level of involvement, there is little reasonable doubt. It’s the detail of involvement in just what and to what degree that is unknown. In the way they try to blandly deny or surreptitiously obfuscate their past, Adams and McGuinness seem to be far from showing 2nd Tier thinking. Of course, as the Jean McConville arrest incident demonstrates, any admission of involvement in violent action during The Troubles (even as an accessory) renders the person making the admission liable to investigation and very possibly prosecution. Which does indeed raise the question, some 16 years on from the Good Friday Agreement: how does Northern Ireland going forward reconcile itself with the hurts and the injustices of the past? An endless series of police investigations will be unbelievably expensive and likely to puncture the province’s fragile peace all too easily. In South Africa, they had the Truth & Reconciliation Commission which was largely held to be successful in the sense of uncovering many of the crimes committed by all sides – though the Commission’s granting of amnesty to certain perpetrators sometimes proved highly controversial (Jane Taylor, 1998). Since 2008, reported by the Belfast Telegraph’s Chris Thornton, Gerry Adams has been calling off and on for some kind of independent truth commission so that the facts of many unaccounted-for murders, bombings, etc, can be revealed. In consideration of the tensions simmering underneath the façade of relative harmony in Northern Ireland, some kind of commission along the lines of the South African model might be about the best the victims and families can reasonably hope for. Profoundly unsatisfactory for them, no doubt, and unlikely to do much to assuage their great hurt(s), but at least they may learn more about the fates of their loved ones. The scope and modus of such a commission would need to be carefully constructed and led by those who were widely acknowledged to be truly independent, with the powers both to compel testimony and to grant amnesty. In such circumstances hopefully Adams and McGuinness might feel safe enough to reveal the true extent of their ‘crimes’. The unpalatable truth is that Gerry Adams is too important to Northern Ireland’s fragile peace to be taken out of it. Yet his credibility as a statesman is undermined by his past – as is McGuinness’. They need a safe forum in which they can confront their ‘crimes’ publicly.